This is Daniel Green. 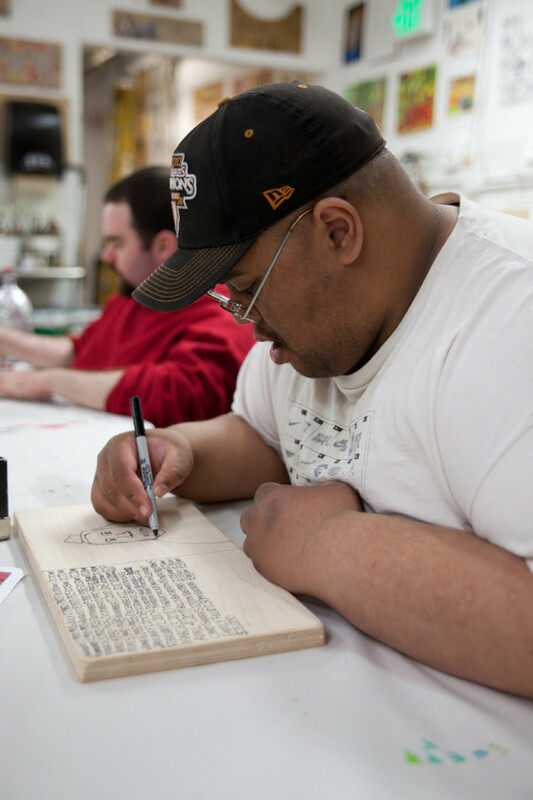 Born in 1985, he's one of the youngest artists to have exhibited at San Francisco's Creativity Explored, a studio space and gallery for artists with developmental disabilities. This is Green's work. Created with ink on wood, the dizzying drawings are jumbled catalogues of contemporary life, bubbling concoctions mixing politics, sports, soap operas, song lyrics, personal dates, family members and friends. Text plays a major role in Green's artwork, with lines from "I have a dream" to "Turkey Burgers $6.00" sprinkled across the wooden canvasses. The artworks are vibrant depictions of everyday life, static images charged with as much momentum as a television screen flittering through channels, flashing a motley assemblage of images and words. 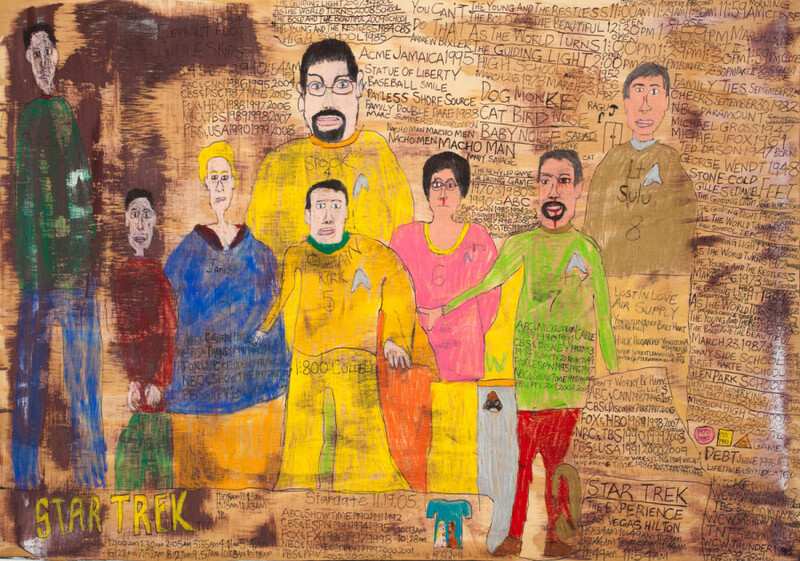 That’s the Star Trek by Daniel Green © 2009 Creativity Explored Licensing, LLC, colored pencil, ink, on recycled wood, 18 x 25.25 inches. Green's current exhibition, titled "Days of Our Lives," presents a combination of images created over the past four years. The work was selected collectively by his teachers, and curated by Creativity Explored's Eric Larson. 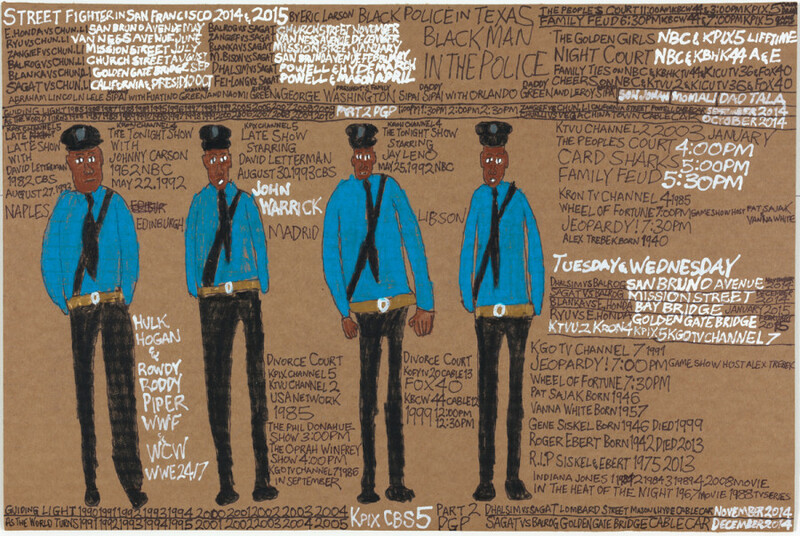 The title references soap operas -- an ongoing motif throughout Green's work. But rather than titling the show "As The World Turns" or "General Hospital," Larson selected "Days of Our Lives" because, in his words: "the artwork is really that -- he's writing the story of his life." "Daniel started coming here at Creativity Explored when he was still in high school down the street, and one of the teachers brought a group of students by from Mission High School," Larson explained in an interview with The Huffington Post Arts. "We knew within a week or two that Daniel was special. He had this great drawing ability and this mysterious text, this combination of images, lists, text and logos that was both unique and extraordinary." Green began working with Creativity Explored around 2007, and his work has maintained a relatively contiguous style and flow thought his work at the studio. This is, in part, Larson explained, because Green came in with little to improve upon. "Some people have very little experience with art and need the basics as far as drawing or painting or working with clay -- whatever medium they're drawn to -- and we'll give them the basic techniques and ways of working. But there are other artists such as Daniel who are very sophisticated and we recognize there is very little we can teach them. We just provide them the materials and the space and the mental space to do what they want to do." 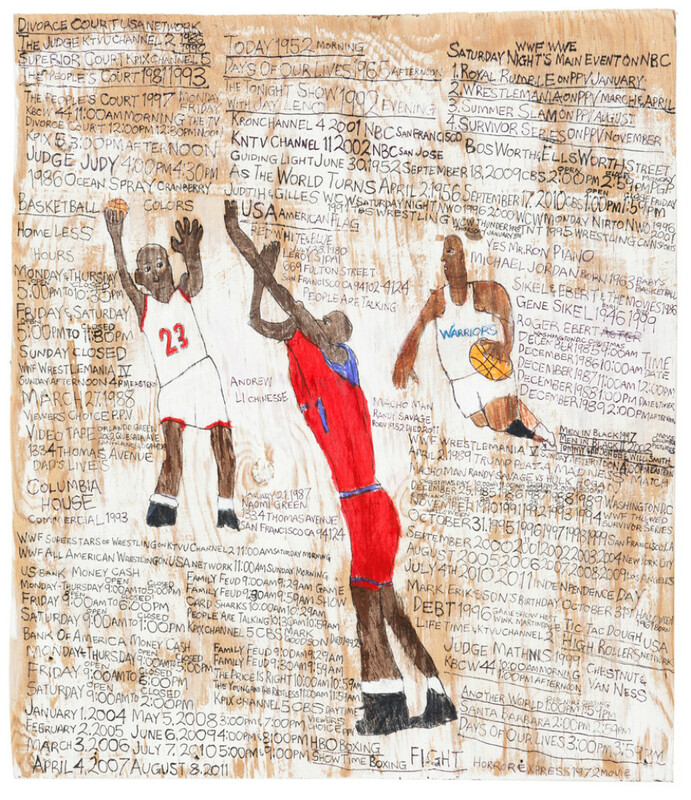 Basketball	Team by Daniel Green © 2011 Creativity Explored Licensing, LLC, mixed	media on	wood, 20	x 17.25 inches. Creativity Explored works with artists to help strengthen their sense of self, explore their potential in the world and supply the tools to establish themselves as working artists. Providing artist mentors, space, materials, art loving peers and the opportunity to exhibit professionally, the art sanctuary lives up to its mantra "where art changes lives." For artists such as Green, Creativity Explored also provides a space for communication, for those who prefer storytelling through images rather than words. "When Daniel first started here I didn't hear him speak at all. He was very quiet, very shy, kept to himself. I've known him now for seven or eight years so I've heard him speak a little bit but usually when he speaks it's in this very jokey way. He doesn't really communicate in a conversational way. You really learn more about Daniel from reading his work and spending time with his images." Larson delved deeper into the collaged network of influences and characters in Green's tangled visual web. "You'll see lists of television shows, movies, dates, streetcars and buses, street names in San Francisco. You'll see friends and teachers from previous schools and ones that he works with now. You'll see images of his family when they were born and sometimes when they die." Although Green is now an officially exhibited artist, he has little awareness of the mechanics of the art world and the art historical trajectory. "This is just what he does and how he spends his days," said Larson. Though he often overlaps in style or technique with earlier artists, it's more of happy a coincidence than a conscious allusion. "I was just thinking about the idea of the cut-up, you know, William Burroughs' idea where you cut up disparate pieces of information and put it together in a collaged way. If you look at Daniel's work it's right there, but I don't think he would have any concept of what that is. But he mashes together information in a way that's kind of disparate and creates these odd juxtapositions. It may be intentional but not with the baggage of art history or anything." Although by some definitions, an artist working reasonably removed from the artistic institution would be deemed an outsider artist, Larson prefers not to use the (often contested) term. "In terms of him being outside the mainstream art world, yeah. But I just consider him an artist. He's got a very unique and strong vision." When pressed on his aversion to the term outsider art, Larson elaborated on his hesitation. "I understand there needs to be a term for it, but it implies that inside/outside dichotomy. On a certain level we're all just artists. Some might have more attention than others but there is a real democratic view of what art is here at the studio. I don't necessarily have a problem with it, because you need to have a label on it in some way, but especially with a disabled community it implies they are somehow outside the mainstream. And I think Daniel's work is actually very contemporary. You look at it and it captures the spirit of the times as far as multiple screens competing for your attention: video games, TV shows, computer screens, he naturally kind of represents that in his art." "Days of Our Lives" runs until March 4, 2015 at Creativity Explored in San Francisco. See a preview below. I	Have	the	Dream	Dr	Martin	Luther	King	Jr by	Daniel	Green	©	2014 Creativity	Explored Licensing,	LLC,	mixed	media	on	wood,	17.75	x	16	inches. The	Rolling	Stones by	Daniel	Green	©	2012 Creativity	Explored Licensing,	LLC, mixed	Media	on	wood,	11.25	x	16.75	inches.
.	Josephine	Baker	Earthquake	Thunder by	Daniel	Green	©	2010	Creativity	Explored	Licensing,	LLC,	marker	and	colored	pencil	on	wood,	23	x	14	inches. Half	Man/Half	Woman by	Daniel	Green	©	2013 Creativity	Explored Licensing,	LLC, mixed	media	on	wood,	12	x	6	x	6	inches.